Welcome to my full Qmee review! My hope is that this review will provide you with all the information you’ll need before signing up. Qmee is a rewards website that pays you for searching the web, taking surveys, or referring your friends. Qmee has been around since 2012, and has a good reputation online. Trust me, Qmee is one of the fastest ways to earn pocket change online — and I’ve tried a LOT of ways. As you’ve probably guessed, Qmee is definitely not a scam in my opinion. It’s 100% free to join, and even after you join, there are no up-sells. It really is free through and through. Something that’s completely free cannot be considered a fraud. But how can Qmee afford to pay you if it’s free? Qmee is in partnership with a number of companies as an affiliate. When you click their ads (which you get paid for), Qmee hopes that you will end up making a purchase so they can earn a percentage of the sale price. Qmee also gets paid every time someone completes a survey, and shares a percentage of that with their users. 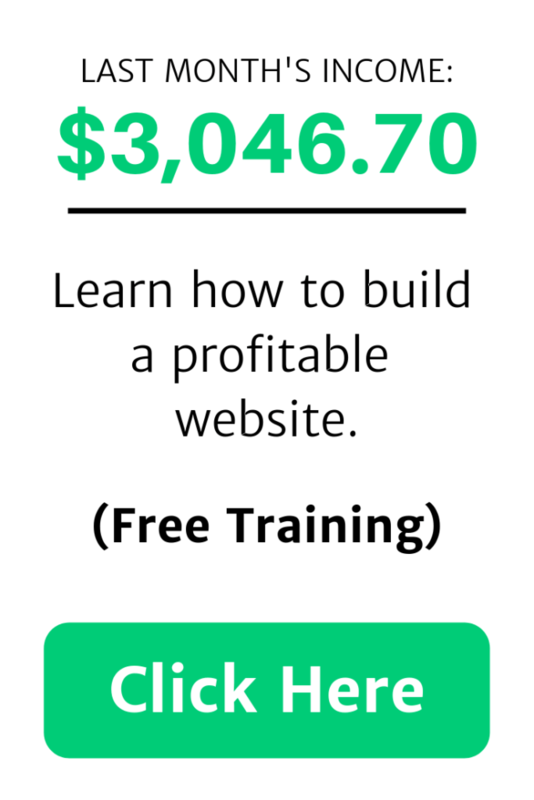 Browsing the web is my favorite way, because it’s passive income – I’m getting paid for something I already do. In order to earn money for searching the web, you need to have the browser extension installed. It’s a quick and easy process, and is the only way to get paid for searching. Qmee only pays you for searching on certain browsers/websites, but pretty much everyone uses these so it’s not really a problem. The signup process is very simple. All you need is an email address and password. Like most websites, you’ll need to confirm your email account after signing up. Click here to sign up. You can also sign up with Facebook or Twitter if you prefer. Qmee ads pop out in a sidebar every so often. The blue circles show how much you’ll earn for clicking each ad. Once you’ve joined, install the browser extension and begin searching normally on any of the supported platforms I listed above. Every once in a while, a left-hand sidebar will pop out with ads from Qmee. When you click on one of the ads, it will take you to the advertised product, and reward you a small amount – usually around the 6-8-cent range. To get back to the page you were initially on, just hit the back button on your browser after viewing the ad for about 30 seconds or so. Qmee tracks how much time you spend viewing the advertised product. If you just click the ad, then hit the back button right away, you won’t be seeing ads all that often. However, if you view the ad for about 30 seconds or so, Qmee knows you were “interested” and will therefore give you ads to click on more frequently – which equals more money (or should I say pennies? LOL). I’ve been using Qmee for about two years now, so I have a pretty good understanding of what types of search words result in ads. Electronics – I’ve had a lot of success with searches for various electronics. In fact, just before writing this I searched for “4k tv” on eBay and made a quick $0.10. Any product – product-based searches are the most likely to show ads. So, searches for “apple iphone 7” or “ceiling fan” are much for likely to show Qmee ads than searches for things like “inches to centimeters conversion”. Numbers – I have had LOTS of success with just searching a string of random numbers (limit it to 3 for the best results). This works well because Qmee includes product numbers in their ads, so if your string of numbers matches a product number, it may trigger a Qmee ad! I have found this works particularly well on eBay, but it works on the other sites as well. Insurance – Google searches for things like “auto insurance” or “life insurance”, etc. tend to trigger pretty high-paying ads. One time I searched for “auto insurance” on Google, and Qmee displayed several ads worth $0.15 each. DO NOT search like crazy, trying to get a Qmee ad to show. First, Qmee will catch on and decrease the chance of showing you an ad. This is because they don’t see you as a valued user, since you wouldn’t really be interested in what they advertise anyway. Second, it’s a huge waste of time (trust me, I tried it myself….) You could literally be sitting there for 2 hours performing searches, without Qmee showing you a single ad (this actually happened to me). Don’t try to game the Qmee system – just search like you normally do. Every once in a while, Qmee ads will show, which can earn you some decent pocket change each month. Qmee also gives you the option to take surveys. The payout for surveys is pretty bad, usually around 50 cents for 15-25 minutes of work. If you’re seriously in a pinch and just need a few extra dollars in your PayPal account, this could be enough to have you covered though. The likelihood of qualifying for every survey is slim at best. I have tried to complete 5 surveys, but every single time I was kicked out. Very likely, this was due to my demographic not being suitable for their purposes, or because I answered a question that disqualified me from taking the rest of the survey. For example, if the survey was about cell phones, they first ask whether or not I own an active cell phone. If I answer “no”, then I’ll be kicked out since I won’t be able to honestly answer the rest of the questions in the survey without owning an active cell phone. Thankfully, for the first survey I was kicked out of, Qmee was nice enough to award me 7 cents to compensate for my loss of time and effort. But after that, I didn’t get a penny for attempting (but disqualifying from) the rest of the surveys. Despite disqualifying from a survey, Qmee was kind enough to reward me 7 cents for my effort. So, take the surveys at your own discretion. Just be aware that they could either earn you a dollar or two now and then, or be a massive time waster like they were for me. The third way to make money is by referring others to Qmee. As a member of Qmee, you have your own unique referral link which you can send to your friends. When someone signs up through your referral link, they become your referral. Once they cash out their Qmee earnings for the first time, you’ll earn $1! The referral system is the most lucrative way to earn money with Qmee if you can get a good number of people to sign up through your link. Depending on how many people you can refer, this could earn you a pretty decent amount. If you have social media accounts (particular Twitter), you can post your referral link for all your followers to see. Tell them how Qmee is helping you earn a little money, and that there’s no minimum cash out amount – so they could literally see money in their PayPal account minutes after signing up. How Much Can You Expect to Earn with Qmee? Well, it depends on how often you search, how many surveys you complete, and how many referrals you can get. If you search the platforms compatible with Qmee many times each day, then you can easily make several dollars per month just by searching and clicking on the Qmee ads when they show up. I mostly use Google and eBay, and I’d say I perform an average of 10-20 searches a day on both platforms combined. One time, over the course of just a few minutes, every single search I performed on eBay got a Qmee ad to show up. I made a total of 57 cents in under 5 minutes! It’s very rare, but extremely fun when this happens. Like I said earlier, the surveys don’t pay that well and the chance of qualifying for every survey is extremely slim. I tried 5, but disqualified from all of them. However, your demographic and your geographic location is different from mine and perhaps you would qualify for enough surveys to earn some decent pocket change each month. Having a lot of referrals is a good way to earn more with Qmee, since you get a dollar when your referral cashes out for the first time. Just be aware that some referrals may never cash out, so it’s definitely not guaranteed that you’ll make a dollar per referral. You can cash out your earnings to your PayPal account, or wait until you earn $5 to get a five-dollar gift card from Amazon, Starbucks or iTunes. No, in fact you can even cash out when you have just a penny if you so choose. This is a major pro with Qmee. 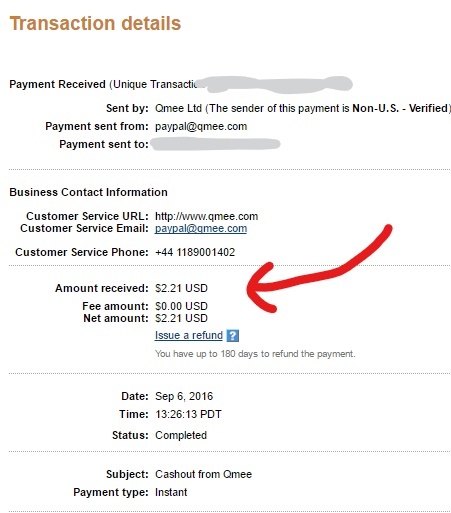 Most sites like this have a minimum payout threshold of a few dollars at least, but with Qmee you can literally cash out as soon as you earn any money. This is true. However, Qmee isn’t supposed to replace your job or even earn you very much. But for a few minutes spent installing the extension and viewing the ads when they show up, you can earn some decent pocket change each month. And if you’re really in a pinch, everything adds up. My opinion on this is that it’s essentially free money. You don’t have to pay to be a member of Qmee – in fact, you can get paid a few dollars every few months for being a member. I’ve seen several complaints that Qmee ads won’t show up for months. When these people contact support, Qmee says their account looks fine and they should be getting ads regularly. Either those people are lying, or they simply never perform product searches. Remember, Qmee won’t show you ads for certain types of searches, so if you don’t search for products online, it’s likely you won’t see any Qmee ads. If you’re worried about privacy, Qmee might not be the best opportunity for you. But then again, if you’re worried about privacy you shouldn’t use Google either. The reason Qmee tracks your searches is so that they can show you relevant ads. They don’t share or sell your information, and I haven’t had a single privacy concern since I’ve been a member of Qmee. Perhaps the biggest complaint is from those outside these four nations, since they can’t use Qmee. The company may open up to other parts of the world at some point though, so hang tight! Oftentimes more than one ad shows up at a time, and sometimes it will let you click on multiple ads in one sitting. Qmee is a legitimate way to earn a few extra bucks every so often. Unless you have a ton of referrals, Qmee is only good for earning you pocket change. If you’re a big fan of having multiple streams of income like I am, Qmee is probably the perfect thing for you. Again, you’ll only earn a few cents a day for searching, but hey it’s free money so why not? I honestly haven’t had any negative experiences with Qmee, except when I was disqualified from every single survey I tried. But now that I’m only using it to earn money for searching, and not for doing surveys, I’m very happy with it. Although Qmee is certainly nice, it won’t earn you a full-time income online. While there are many ways to make money online, there are only a few that are both lucrative, and work very well. All you need is a computer and an internet connection – seriously! The earning potential is truly limitless – I know some people making millions every year! The only downside with affiliate marketing is that since it’s a real business, it takes a lot of time before you see any results. With that said, it is certainly possible to make six figures in one year if you have the proper training, focus, and put forth consistent effort. Qmee, on the other hand, can put a few pennies in your PayPal account almost instantly. Plus, it takes virtually no work. The only difference is that you won’t quite make six figures, haha. Have you ever used Qmee before? What do you think of it? Feel free to leave a comment below, and if you have any questions, I’d love to help out! I am in the UK and i find the surveys are the only way to make cash with qmee the searches tend to just give voucher codes and not cash, to get accepted you have to try and guess what the survey is about, and then adjust your answers to the screen questions to improve your chances of getting to the survey, but i have only been a member since last nov and i have managed to withdraw 60 GBP in Dec and 50 GBP in Jan all from surveys. And in the last 3 days i have completed 17 surveys. Thanks so much for sharing your experiences with Qmee surveys! I have been using Qmee for three months now. During those three months, I have only qualified to only two surveys and that’s it. The survey that I did do and got to the end, it was immidetaly disqualify. I truly believe that the survey is a scam and won’t pay you for it. Even using it only for search, I will get nothing in turn. They are now wanting people to take a screenshot of the surveys they have done and reported it. That right there is a big red flag to me. Congrats to those who are making money on here. But for me, I am deleting it and go with bing, Microsoft or Swagbucks to earn something rather than nothing at all. That’s unfortunate, and I had basically the same experience with surveys. Every now and then I earn a little from searches though, so used in conjunction with the other sites you mentioned it’s actually working out fine. I’ve checked out a bunch of these types of sites, though I haven’t looked at Qmee. It seems like a similar concept to SwagBucks or InboxDollars in that yes, they are legitimate, but they’re mostly just a waste of time. Your time is better spent doing almost anything else. I’ve had the same experience you have with online surveys. It doesn’t matter where you take them, the payout is awful and most of the time you get disqualified for one reason or another. It’s just not worth the time. It is similar to the sites you mentioned in that it won’t make you a substantial amount, but if you just use the search feature and search like you normally do, it’s not much of a time waster in my opinion. Yeah, surveys can be good for some people, but I’m definitely not one of those people lol. To me, they’re just a frustrating waste of time….